Focus Features opens A Monster Calls on December 23rd, 2016. NYC MOVIE GURU: Francois Truffaut once observed that a truly great film has a perfect balance between truth and spectacle. Do you agree with his simplification? Patrick Ness: Maybe. I don't know. I have to think about that. Director John Ford was once asked what the difference between a good film and a great film is and he said, "3 great scene and no bad scenes." I like that. The 3 great scenes are the spectacle bit. When I'm writing, I don't think in terms of spectacle per se, but I do think in terms of plot. It has to work. The story has to be seamless and go somewhere. The machinery and engineering has to work. When it does work, then I can ignore it because I know that it's working. And then I can put in the truth, I suppose. NYC MOVIE GURU: How do you avoid preachiness as a writer? PN: When you write for young people, it can't be sermonizing. There's always this simplistic idea that when you write for younger people, you have to have a message. I would resist that because even when you agree with every word of a sermon, you don't want to hear a sermon; you want to hear a story. The spectacle contains within it everything that you want to say if you're paying attention to it properly. NYC MOVIE GURU: Why did you decide to make Conor 13 years old in the novel? PN: For me, 12 and 13 are the barrier ages. It's where you're just about to change. That's a very frustrating time for a kid because it's when you start to feel the injustice of being young. Up until then, being young is a great time, but, then, people start treating you like an adult when it's convenient for them to do so. There is a sense of injustice about that, especially for Conor [in A Monster Calls] because he knows full well what's going on. None is treating him quite as he should be treated. I think all human beings can relate to that because we all feel like we're about to change, but that's the first big change that we all have to go through. We have to go through it alone. It's the first time you step away from your family and say, "I am not just this. I am also this new thing." It's almost a violent action because you're stepping away alone. It's no wonder that so many teenagers are so difficult. It's about the age that it's supposed to happen, so it's a good place to tell a story. PN: One of the rules of horror films is that the villains have to be defined. If they can do anything, that's boring because they might as well do nothing. That's the challenge of CGI: it could do anything. So, that kind of robs it of its specialness. We took a moment in the post period to make sure that the monster was utterly realistic so that moments between Conor and his mother and Conor and his grandmother, the bullies and even when Conor is talking to the monster, hopefully what you're seeing is not a pause for the special effects, but that it's the real thing you came for. I know exactly what you mean. When you remember Jaws, you remember that scene on the USS Indianapolis. When you remember E.T., there are plenty of special effects, but you remember Elliott and E.T. talking. NYC MOVIE GURU: In what ways do you think kids respond to A Monster Calls differently than adults respond to it? PN: Kids really do have an easier time with it than adults do because they see it as a story about themselves. They see themselves as the hero and they tend to be really pleased that they're taken seriously. It's adults who struggle, particularly moms. It's quite hard on moms. PN: All you have to do is read what teenagers write themselves. Their own fiction is way darker than anything that I could publish. That's as it should be because that's the age when you're pressing your boundaries and stepping over them. To leave a teenager to face that alone is the immoral action, so I take dark materials, put them in the book and engage them so that you tell the truth about what's also possible alongside the dark material: friendship and joy and hope. 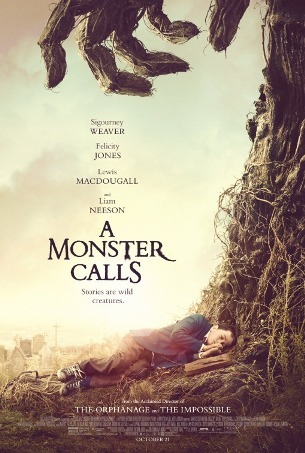 NYC MOVIE GURU: What would make a good double feature with A Monster Calls?